The world of the Unseen holds a formidable challenge. Could you possibly be blind? The walls are not there yet they are in this watery world. 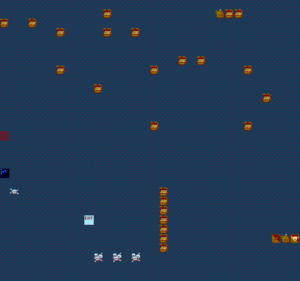 Few of the levels in world four, the sea level, contain invisible walls. This is one. Not only is it an invisible wall, it's a labyrinth. Most move in a catacomb sort of way. Another invisible wall level. Remember, catacomb like. The two upper exits both skip the Clue Room and lead to room 67. The lower exit leads to room 66, the Clue Room. The easiest way to the Upper Right Exit near the right wall is by going Up from the start point. Then head towards the Cluster of Ogre Spawn points. The path to the Exit is in the bottom right corner past the cluster. From there it is straight up to the Exit. The top-right exit will lead to the treasure room. 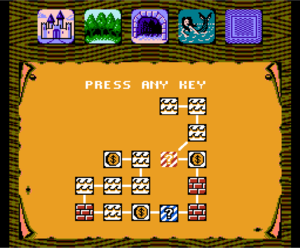 The bottom-right exit will skip the treasure room and lead to Level 68. Grab the extra potion item in the central room with the locked gate along with the three bombs and two food kits - you will need them for getting through this Clue level. 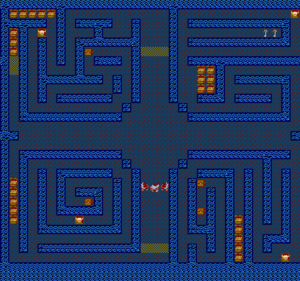 The exit is randomly situated in the treasure room and only one exit will lead out. All the rest are fake exits. The easiest way to make it to the Exit is by using the transport pads with the diagonal exit by pressing both Up/Left or Down/Right, depending where you want to go. The best strategy is to ignore the treasure chests and focus on finding the exit. Refill the health and collect treasure only if it is in the way. Make it a high priority to detour away from the stun traps, too. The Locked Chest in the Upper Left is a Trap, it has a Ghost Spawn inside. The Locked Chest in the Bottom Left will give you a Bomb. 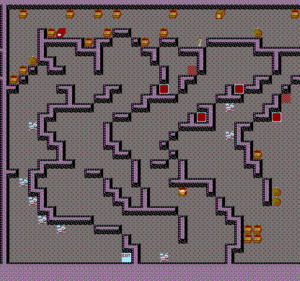 The First Locked Chest in the Bottom Right is an Energy Leach, but behind that the Second Locked Chest is hiding the Exit to Room 69. 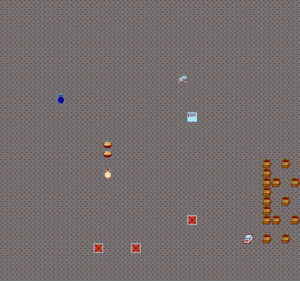 The Locked Chest in the Upper Left has an Invincibility Power-up. The Teleport pads make this level a bit frustrating as it seems they teleport at random. The first, Northeast of the start point and Second From the Right wall, takes you to the far Right Pad. The Far right pad when stepped on again, takes you either back to the Second pad or to the third pad from the right. When the Third pad is stepped on, it takes you either to the Second Pad or the Fourth pad from the right. If you make it to the Fourth Pad position, then you can continue to the exit by hugging the wall and proceeding left. The Clue is hidden in the wall of the Bottom Right Corner chamber. To make it to the Exit you need to trigger the three Switch Squares. Two are obvious Middle Right, and Bottom Left Chamber, but the third is hidden in the Locked Chest in the Middle Left. The upper Exit, near the middle of this level, must be reached by using the flashing floor trigger that is locked away behind the door. Because the only key is at start of the level, you will need to carefully maneuver towards the right without accidentally unlocking the other doors (which contain Death and monster generators, among other things). 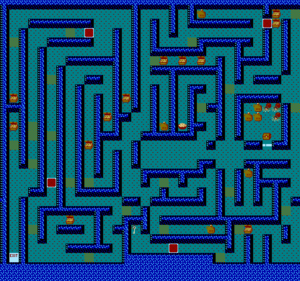 The lower Exit, located near the bottom-left corner, will lead you to in the linear path towards Level 73. The locked chest on the left will give you an extra bomb. 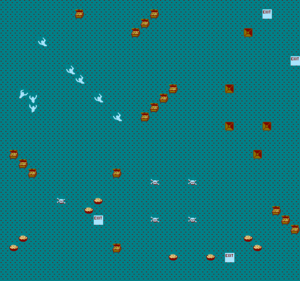 The walls of this level are obscured by invisibility and cannot directly be seen with the naked eye. Head left immediately and switch the flashing floor trigger above you. 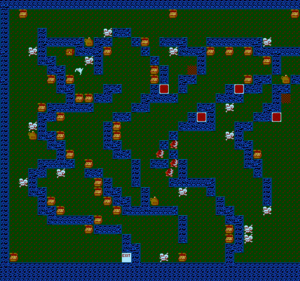 The column of treasure can be obtained by heading south, then left through a middle hole in the wall. You will be able to navigate to it by using the skeleton generator as a reference point. 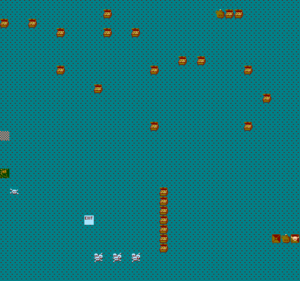 Follow the treasure to the bottom of the level and hug the wall as you head to the left. You will see a row of skeleton generators. Again, use them as a reference guide. Eliminate them and follow the path they make to the left. Maneuver around the invisible wall at the end of the hallway and bend the turn upwards towards the exit to get in to Level 74. 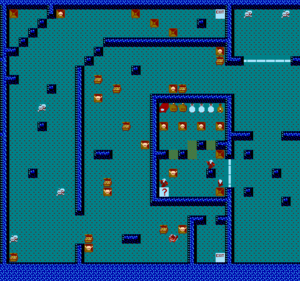 This level would be the ideal room to refill health if one of the treasure rooms were missed because of the unsuccessful exit. Most of the food is easily accessible. The stock of food behind the door will require two keys - one of which is located at the bottom of the room. One key will unlock the door and another key will unlock the chest blocking the entrance into the room. The only key this level has is guarded by Death. He is waiting behind the teleporter. However, you can take the teleporter and be taken to the exact spot he is standing on to eliminate him and grab the key for yourself and use it, if its needed in this room. You will probably need a bomb to clear out the acid blob monster blocking your way in the narrow corridor to the left that will lead to the Exit. If you only have one bomb, it is best to use it to clear the way rather than on eliminating Death. Taking the teleporter if the acid blob monster is adjacent to it will also result in its elimination. There are two Deaths between the crumbled wall sections waiting for you in the openings of the corridor. The power-up item first found at the left is a Super Shot box that will go completely through the walls and through Death, while the other power-up at the end is Temporary Repulsiveness. Make sure you grab it by either knocking out the three grunts blocking you or by firing a single shot and running ahead of your own projectile before it reaches and destroys the power-up. Quickly repel Death out of the corridor and move into the array of teleporters; if you have enough time, you can make your way to the far right and remove the crumbled wall sections leading to the right Exit. To return from the room past the teleporter array, you will need to land on the exact position of the teleporter one position higher (up) from the first at the bottom. You will also need to press and hold down to be able to pass back through it. There is an Extra speed potion tucked behind a crevice with a flashing floor trigger in front of it in the middle chamber of the room. Grab it to increase your character's speed. The far right crumbling wall will lead to the right Exit. The teleporter array towards the left will lead to the key and the corresponding locked door, unlocking the left Exit. The right exit will lead to Level 76. The left exit will lead to Level 78. You will skip Levels 76 and 77 if you use this exit and be taken to the treasure room. Straightforward level with a fair amount of food. The generators in the center will produce sorcerers. Get through them quickly to reduce inflicted pain. The chest contains the power-up Temporary Invulnerability. The room is almost exactly like Level 69. Grab the food and the key. There is a lot of treasure here, too. Pick it up if it is not inconvenient for you and head for the exit at the end. 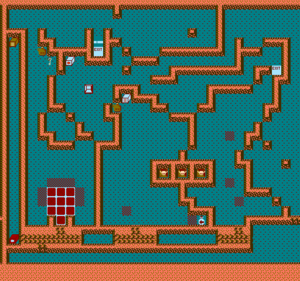 The exit is located at the bottom-left corner and will lead to the treasure room, Level 78. 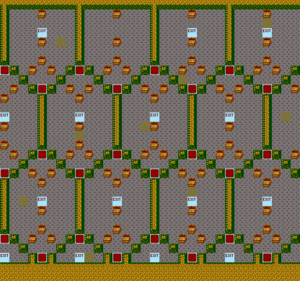 Here is the last treasure room for World 4. This page was last edited on 1 November 2018, at 17:48.